LINCOLN, Neb. — Call it a breath of fresh air. That's how senior defensive lineman Freedom Akinmoladun sees it. When former Huskers and Blackshirt greats Grant Wistrom and Jason Peter spoke to the team Friday, it lit a fire for the players in the room. "Having them come in and almost give us a fresh breath of air and having them come in rejuvenated us and made us realize we still have a lot more to go to get to where they expect us to get to," Akinmoladun said. As a result, Saturday's practice was more intense than it has been in a long time. Defensive coordinator Erik Chinander thought he saw more shocked faces after Wistrom and Peter spoke, but that it translated by Saturday morning. The players felt the same. "I don't think I've ever seen more eyes bigger [that day]," Akinmoladun said. "[The team was] inspired to practice. Having them come in and tell us what a true Blackshirt is and what we have to do to get there and seeing everyone's eyes lighting up, running to the ball, scuffles when the offensive line does some stuff, it's just nice." It was important to Wistrom and Peter to express what a Blackshirt is to the team. It was important to Chinander, too. From Chinander's perspective, players like Wistrom and Peter walked into a program that had already set a Blackshirt example. He doesn't believe the current team had that example in place. That's why a good basis of Friday's talk surrounded what it truly means to be a Blackshirt. "You’re constantly putting the team above yourself," Wistrom said on Hail Varsity Radio. "I’m not playing for myself, I’m playing for the guy next to me, I’m playing for Coach Frost, Coach Chinander, I’m playing for my mom or my dad. You’re never doing things for yourself. Whatever is expected or asked of you, you do it no matter how menial you think it is or how beneath you you think it is." Akinmoladun joked that Wistrom and Peter "are psychos, but in a good way." He walked away from the talk inspired, and said he's re-played Friday in his mind quite a few times. He also wants to live up to their expectations. Chinander saw it as an opportunity to solidify the message the coaches have been preaching since they arrived at Nebraska. "They hear it from coaches all the time," Chinander said. "That's what coaches say, but when former players are setting the standard and verbalizing what it should look like? I think it's almost a shock that they're saying what the coaches are saying." And as Chinander expected, the team did embrace the message of the former players. They've also taken it as an opportunity to build the bond of the Blackshirts. 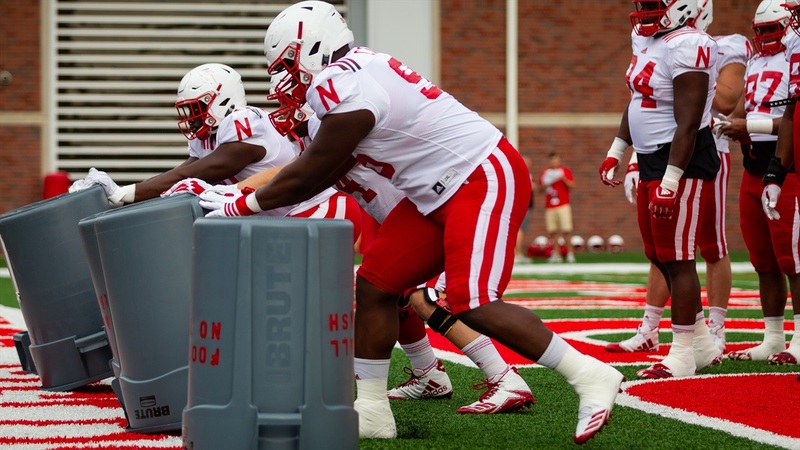 "For me and most of the D-line, it shows that our family is bigger than what we think it is," Akinmoladun said. "It's not just people here. It's people who played before us, the fans, our families. It's everyone that's a Cornhusker. We know that if we ever have a bad day, our brothers and everybody else expects us to rise for the next day. It's really a blessing that they came. "Even when [Wistrom] came down the night before, it was a true blessing to see that he really cares about us. Even though we're not his original team, he considers us as his brothers." Chinander had long wanted to make the talk with Wistrom and Peter happen, so he saw Friday as a big step in building the Blackshirt tradition up. Now it's taking care of their message, and ensuring it continues into the season. "I've said before that the Blackshirts are the greatest tradition in college football," Chinander said.